Getting to and from the hotel from the airport couldn't be easier as direct trains run from Roissy Charles de Gaulle and Orly every 15 minutes. Journey time is just about 30 minutes. Perfectly located on the Place du Panthéon, overlooking the majestic monument that celebrates the important historical figures that helped build France. You can go jogging in the Jardin du Luxembourg and easily walk to most of the main museums such as the Musée d'Orsay, the Musée du Louvre and the amazing Sainte Chapelle. Don't miss the Eiffel Tower and the Opera of course ! 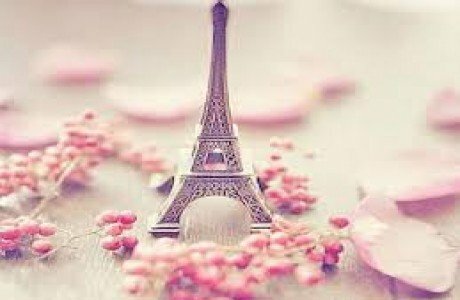 Paris is at your feet ! You will discover what is best. Bakeries, pastries, cheese & wine bars, and of course, restaurants. Prestigious establishments near the hotel such as Le Coupe Choux, L'Estrapade, Les Papilles, Le Trublion, Le Café de Flore, Les Deux Magots, La Tour d'Argent, La Truffière, etc. Let’s not forget the culture with several bookshops and arthouse cinemas that make our area so special near the great Sorbonne. The most famous designers, the most amazing shops of prêt-à-porter and jewellery, the biggest galleries of Art or Antiquity but also the best chocolate boutique and pastries of Paris, you will find it all these wonders in the Saint Germain area. Very close from our hotel are the fantastic places that you don't want to miss: Le Bon Marché, Les Galeries Lafayette, and Le BHV. Our staff will have the pleasure to give you the best tips to reach all these places in no time ! It has been known as the famous temple of swing for 70 years! Every night since 1946, a jazz band performs for the listening pleasure of regulars and vistors alike. Whether you are just a Jazz-Lover, or are a professional musician, the exceptional atmosphere of the club will remind you of the Cotton Club and the Savoy. Le Caveau de la Huchette, located in the Latin Quarter, welcomed the greatest jazzmen in the world: Jean-Paul Amouroux, Georges Arvanitas, Pete Allen, Marcel Azzola, Ronald Baker, Gianni Basso, Sidney Bechet, Milt Buckner, Claude Bolling, Art Blakey and his Jazz Messengers, Carlos, Bill Coleman, Al Copley, Gene Mighty Flea Conners, Al Copley, Kenny Davern, Wild Bill Davis, Manu Dibango, Sacha Distel, Dany Doriz, Harry Sweet Edison, etc. The street Mouffetard (Rue Mouffetard) is one of Paris oldest and liveliest neighbourhoods. The first half of Rue Mouffetard, that goes from the top to Place de la Contrescarpe, and on the way to Saint-Médart, has many restaurants, shops, cafés, brasseries, crêperies, and other fast food services. At night, it is the most touristic place of the 5th district. 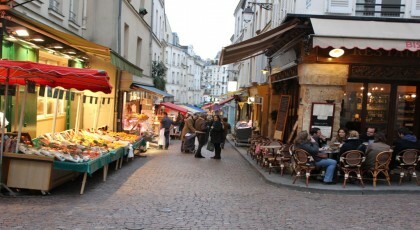 The second half of Rue Mouffetard leads to a daily open-air market. On the way, there are lots of traditional shops. You will find wine cellars, grocery stores, butcher shops, fish shops, cheese shops, and plenty of typidcal Parisian cafés and bars. The Catacombs, which form a veritable labyrinth beneath the very heart of Paris, were created in the galleries of the former quarries whose stone was used to build the capital. 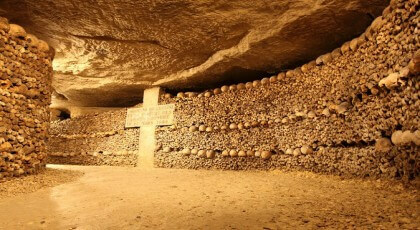 Situated twenty metres below ground, the ossuary contains the remains of millions of Parisians, transferred there gradually between the late eighteenth and mid-nineteenth centuries. In the long maze of dark galleries and narrow passages, visitors can see a tableau of death with bones arranged in a macabre display of high Romantic taste. This unusual site movingly brings the history of the Parisian people back to life and takes visitors on a timeless journey.